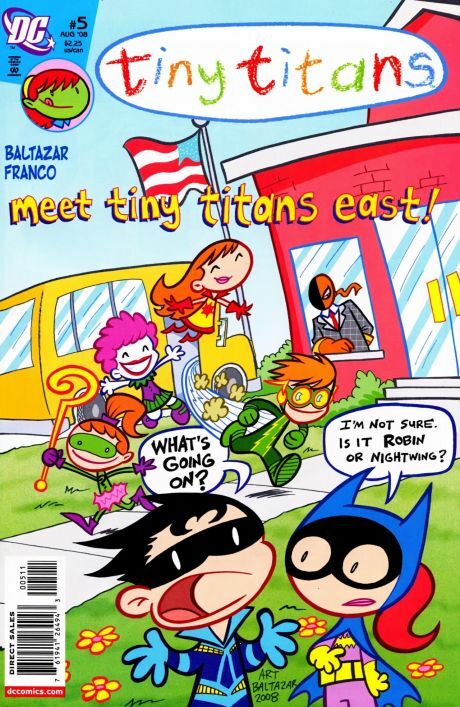 The very first comic I ever tried to read with my daughter was Art Baltazar and Franco’s Johnny DC title Tiny Titans. 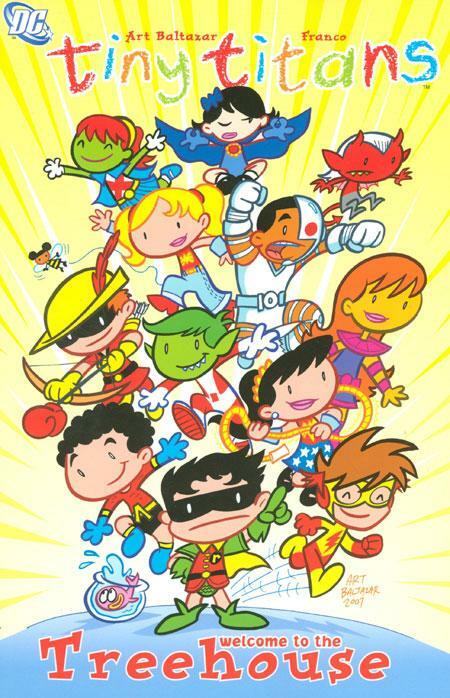 I was a huge fan when the book launched in 2008 thanks to its mix of inside DC fan humor and ridiculously adorable artwork. 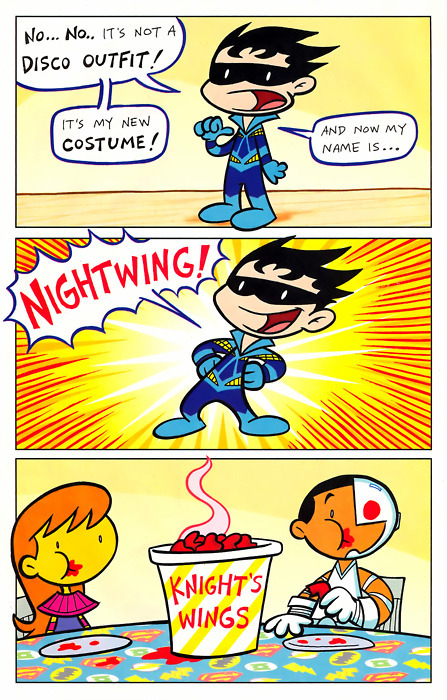 It was like a classic comedy comic, but tailor made for DC Comics fans like myself. However, she was probably two years old at that point and wasn’t interested in reading comics of any kind. More recently, when I got the idea to start looking at various kids comics, I pulled Tiny Titans: Welcome To The Treehouse off my shelf. I got through the first issue of six collected in this volume and set it aside to do that whole parenting thing. Later that day we caught an episode of the excellent Teen Titans Go! on Cartoon Network. When that was over and I saw that my daughter had enjoyed herself, I showed her Tiny Titans and started reading to her, pointing out the characters as we went. She loved it and it has since become a mainstay in her reading rotation. 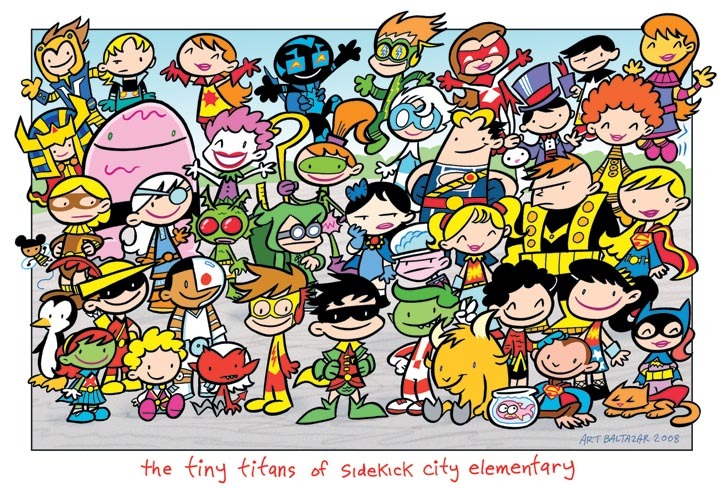 Tiny Titans exists in a world where pretty much every character ever associated with the Teen Titans is a kid attending Sidekick City Elementary. The issues are broken up into comedy strips in the one-to-eight page range. Each issue starts with a one page splash gag usually featuring one of the kids and their mentor. For instance, Green Arrow makes a William Tell joke as Speedy leaves for school with an apple in the first issue. That same issue features a longer bit about Cassie Sandsmark abandoning a more traditional Wonder Girl costume for the T-shirt and jeans look seen in the comics of that era. 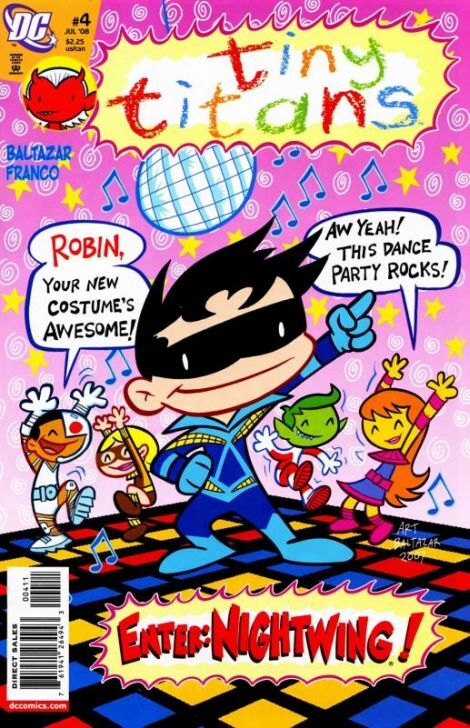 Other issues feature strips about Robin changing into his Nightwing identity, Supergirl and Blue Beetle showing up while the other Titans are on a field trip and the rocket-enabled penguins from Batman Returns getting out of the Batcave thanks to Beast Boy. My main concern while reading these stories to my three-year-old was that she just doesn’t have the context to find them funny. Is it humorous for someone who knows the long history between Slade Wilson and his daughter Rose when the former shows up as the latter’s new principal? Definitely. Is it funny for my kid? I wasn’t so sure, but then I realized that there’s a much more simple joke going on under the surface that becomes funnier if you know continuity or history, but not knowing those things doesn’t necessarily take away from a less informed reader’s enjoyment. While going through the rest of the trade with my daughter, she seemed happy to follow along with me, ask about the characters and laugh when I laughed. That’s when I realized that kids in the three-year-old arena don’t necessarily need context to have fun with a book they’re enjoying. My daughter’s become so familiar with Welcome To The Treehouse that she has favorite characters, stories and just gets excited to sit with me while I read these adventures to her. Basically, Tiny Titans exists as its own thing to her and not a reference to something else. A big reason that kids can dig into this book is because the art is just so fun. Everyone is cartoony, bright and usually smiling, so it’s hard not to want to jump right in and find out what they’re all about. Plus, they do fun things like go to school, hang out in tree houses and play tag. That’s a pretty low barrier of entry when it comes to kids who are used to looking at story books of other children doing fun things and getting invested in them. When it comes to potentially offensive or troubling material, Welcome To The Treehouse doesn’t have much in that department. Kid Devil and Trigon both look pretty demonic, but in the cutest way possible. I was surprised to see Dr. Light appear as a teacher at some point. Now, he’s clearly not doing anything in this book that he became infamous for in Identity Crisis, but he is there. If your kid is Wikipedia proficient, you might want to be careful how deeply they delve into some of the characters’ histories. In my daughter’s case, she’s still a few years away from that and she doesn’t seem to have a problem with either Trigon or Kid Devil, so this book is aces for her. In fact, she’s constantly asking where Kid Devil is and if he’s going to show up again. At this point, she asks me to read her Tiny Titans before bed and I can’t tell you how cute it is to hear her say, “Daddy, I want to read a comic book.” While she might not be in on all the jokes at this point, she seems to enjoy the time we spend reading these books and adding more and more characters to the list of ones she recognizes. She especially likes the pin-ups that feature a variety of characters and does her best to name each one. If you’re feeling down, I highly recommend teaching your toddler how to say Cyborg or Miss Martian. To check out Tiny Titans: Welcome To The Treehouse you might still be able to get the single issues or trade at your local comic shop. The collection is also available on sites like Amazon and the entire series can be purchased on Comixology either in TPB or single issue form. Have a suggestion for future installments? Leave a comment and let me know!